Join us and advocate for an Education, Financial Stability, Health or nonprofit strengthening issue that you are passionate about. Our community needs you to have an impact on public policy decisions. Advocating in and for our community does not simply mean lobbying on a specific piece of legislation. There are many ways that you can advocate. See below for ways you can create social change for Knox County. Tell your family, friends and co-workers about United Way and the great things we are doing to make Knox County an even better place to live, to work and to raise a family! Wear the shirt! 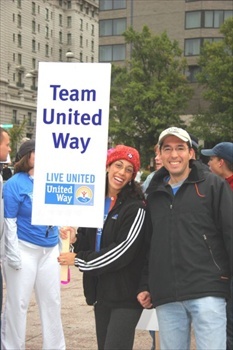 Show your commitment to living united by wearing a LIVE UNITED t-shirt as you go about your every day routine. Contact United Way to find out how you can obtain your very own LIVE UNITED shirt. Do you want to see change in our community? Write a letter to the editor and speak out about opportunities for change...and don't forget to invite others to join you in making a difference or becoming more informed. Learn more about Knox County's needs and issues. Don't be afraid to ask for information that helps you become more informed. Visit United Way's data tab to view information from local community health assessments, school data, service statistics reported by United Way partner agencies and other community organizations, and more! Host a community conversation with your friends, coworkers or neighbors. Learn about what people say are their aspirations for our community and talk about how you can work together to address challenges. Dial 2-1-1 to become familiar with how this 24/7 information and referral/crisis phone service works. You will then be able to tell someone else about this important Knox County program and encourage others to use it before a significant crisis occurs. Request that your workplace have a United Way speaker address fellow employees about local needs, programs and services that advance the common good for all of Knox County. United Way prefers to talk about needs and services because when the community is educated, feels informed and becomes connected, contributions are made to support the annual campaign effort and nobody should ever feel forced to make a contribution! Participate in United Way's Poverty Simulation and commit to making a difference in the war on poverty! So many of the issues and needs communities face are the result of poverty and the tough choices associated with living in poverty. Recruit a friend to join you and contact United Way regarding upcoming Poverty Simulations.